Edward’s wife Jo wrote about the painting in a letter to Edwards sister Marion: “Ed is about to start a canvas - the effect of night on a gasoline station…” Well if eerie was what he was going for, he nailed it. I’d say there are three subjects Ed likes to cover, solitary people, melancholy and the lonely road. Gas has all three of ‘em! Yet, it’s kind of confusing. The guy doesn't look like he works at the gas farm. I mean, aren’t those guys supposed to wear grease stained overalls instead of a three-piece suit? So what is he doing all alone, at a gas station, without a car, at the edge of a forest? No but really, since our view is blocked, what IS he doing? Also, are those bushes on fire? Is this purgatory? What is this? Gas is a 1940 painting by the American painter Edward Hopper. It depicts an American gas station at the end of a highway. The subject was a composite of several gas stations Hopper had visited. 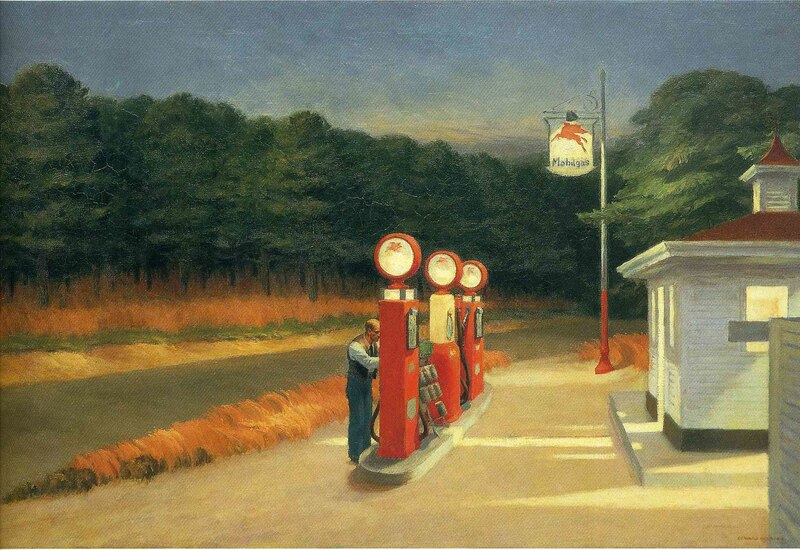 According to Hopper's wife, the gas station motif was something he had wanted to paint for a long time. Hopper struggled with the painting. He had begun to produce new paintings at a slower rate than before, and had trouble finding suitable gas stations to paint. Hopper wanted to paint a station with the lights lit above the pumps, but the stations in his area only turned the lights on when it was pitch dark outside, to save energy. Check out the full Wikipedia article about Gas (painting).